Why be a millionaire, when you could be a Stallionaire? Click here to play! There is plenty to play for in this equine slot machine, so head to the starting gate and start racing for cash! 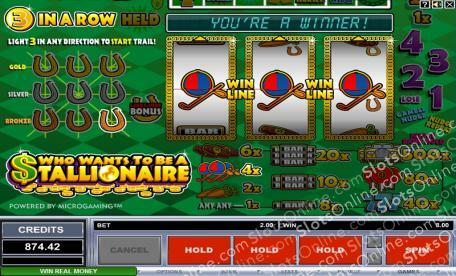 Who Wants To Be A Stallionaire is a fun 3-reel slot played across a single pay line. There are no Wilds or Scatters, but you have the ability to Nudge and Hold any reel after certain spins, therefore increasing your chances of big wins! If you manage to spin up any three horse shoes on the Lucky Shoe rack you will trigger the special Who Wants To Be A Stallionaire Bonus Game. Once inside, you will be playing for an incredible Super Jackpot. Leave the horses at the gate, and step into a world where horsey madness and jackpot mania reign supreme. Who Wants To Be A Stallionaire? Do you? Once you spin up any three horse shoes across the Lucky Shoe rack, the Who Wants To Be A Stallionaire bonus game will be activated.